The B.C. Open Textbook Institutional Guide is a starting point to help your institution incorporate open textbooks and other OER into the classroom starting with an OER Policy Tool. This page also provides information, guides, videos, brochures, posters, PowerPoint slides, research, and an adoption tracking tool. Created by Amanda Coolidge, Senior Manager of Open Education at BCcampus, and Daniel Demarte, Chief Academic Officer, Tidewater Community College, this institution-level Open Educational Resource Policy Development Tool was created specifically for college and university governance officials, as well as individuals who have responsibility for developing institutional policy, to promote the utilization of OER and scale efforts to full OER programs. Read about BCcampus Open Education (previously the B.C. Open Textbook Project. Read about other Canadian Open Education Initiatives. Learn more about open textbooks. Find the open textbook you need with the Open Textbook Directory. Learn how to evaluate books and resources in a repository by using the OER Repository Assessment Rubric. Get help assessing an open textbook or other OER with the Faculty Guide & OER Checklist, v.2. If you’re interested in creating OER, see the OER Workflow diagram (thanks to Billy Meinke at the University of Hawaii). As an additional resource for instructors and their students within a course. Keeping it short. You can explain more when you get there. Put the ask at the beginning of the email and bold it, most of us just skim emails, so this will help it stand out. Put a timeline on it (within the next two weeks). If they say they can’t make that, you can always ask for a later date. Do you have 15 minutes in the next two weeks where I could stop by your office and meet with you? I found some high quality materials that may be a good fit for your course and I’d like to bring them by to show them to you. What’s also great about them is that students will have instant and unlimited access (no excuses!) and you aren’t bound by copyright since they are openly licensed. I noticed you have office hours from [times] on [days of the week], maybe I could stop by 15 minutes before one of those? To assist institutions, faculty, and staff with using, revising, and writing open textbooks, refer to the B.C. Open Textbook guides and tools below. The B.C. Open Education Librarians (previously BCOER) is a grassroots group of BC post-secondary librarians interested in Open Educational Resources. They have developed many resources for librarians and others to use. For a list of Library Guides used by post-secondary institutions around British Columbia, visit BC Open Education Library Guides. Videos are an easy and personal way to learn more about open textbooks. Below are several clips produced by institutions who are using open textbooks, and BCcampus. Feel free to download and use these resources to help spread the word about open textbooks. Open Textbooks Brochure (PDF), size: 5″ x 7″. Open Textbook Poster (PDF), size: 11″ x 17″. 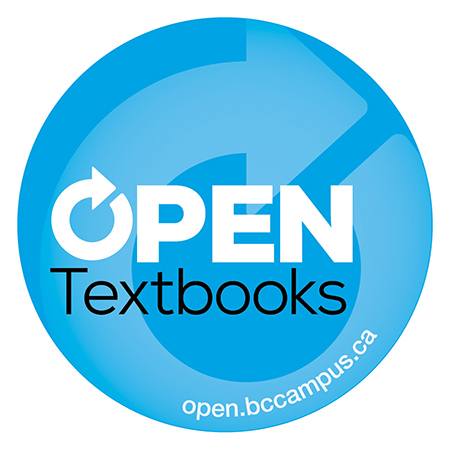 Open Textbooks Sticker (JPG), size: 3″x 3″, circle. The team at OpenSUNY in New York has created the following assessment tool. Accompanying this is the OER Success Framework Rubric which explains the range of support for each indicator. Herbert E. “Buddy” Muse, Distance Learning Associate Director at Montgomery College in Rockville, Maryland, has graciously shared his document, Ideas for Spreading the Word about OERs at Your Institution. It is released with a CC BY licence so feel free to download it and revise for your institution’s needs. If you’re looking for ways to engage faculty and staff at your institution using group activities, look below for suggestions from the open education community. Wm. Preston Davis, Ed.D., Director of Instructional Services at Northern Virginia Community College says: “I have had success by creating a scenario where I assigned the audience to teach a specific course (real or made-up) and asked them to find a specific item for a lesson. I would assign the item per table or section of the auditorium. Some items I would request include: an open textbook, an openly-licensed image or photo, a video, a public domain book/article/audio file, etc. related to the specific lesson. You can specify the type of licence for a more OER aware audience, or post a cheat sheet slide with web links for a novice group. I would have the audience report what they found, and would share some of my own findings to demonstrate how simple it is to find OER. Ask faculty to think of 1 course they teach. Estimate new, used and rental costs for the textbook. Provide a link to college bookstore. Have faculty check their guesses. Can have a small group discussion then. Or, you do poll of people over estimating, under estimating or accurately guessing the prices. OER Research Toolkit – developed and offered by the Open Education Group is used under a CC BY licence. We ask B.C. post-secondary faculty to fill out the Adoption of an Open Textbook form if they have adopted an open textbook from either the B.C. Open Textbook or another collection. This information is anonymized and included in our general adoption statistics. To help track potential and confirmed adoption numbers at your own institution, use the Open Textbook/OER Adoption Tracker spreadsheet. This resource was developed by Lansing Community College in Lansing, Michigan.